When you think of Nashville, what comes to mind? Country music? Cowboys? If that’s all, then you are really missing out. While Nashville is heavily influenced by its music scene, the city has so much more to offer. One of the largest hotels in the world, the Opryland Resort and Convention Center is one of the city’s star attractions. 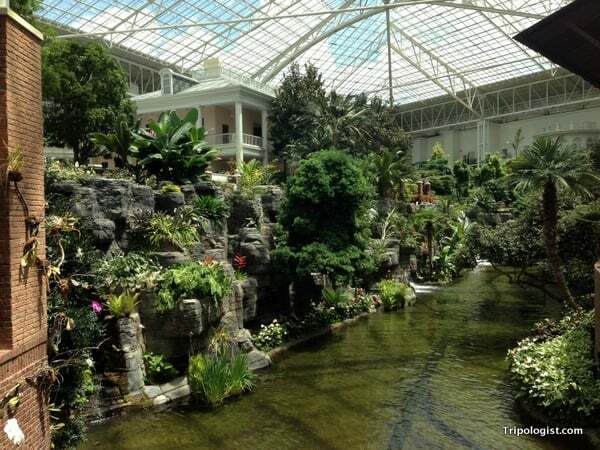 The hotel features 3 large atriums, each featuring thousands of plant species and water features. The largest area, the Delta Atrium, features 4.5 acres covered by a glass roof, a .25 mile long river, and several shops and restaurants decked out in a Cajun theme. Inside the Delta Atrium at the Opryland Hotel. One of the best things to do in Nashville, Tennessee. 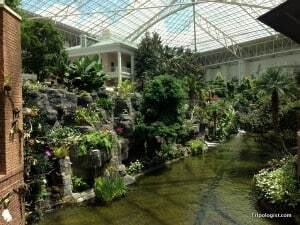 While visiting a hotel might sound odd, visiting the Opryland Hotel is one of the best things to do in Nashville. Expert Tip: For those not staying at the hotel, don’t park in the hotel’s parking lot; it costs money. Instead, park in the back corner of the Opry Mills Shopping Center, near the movie theater, and walk the five minutes to the hotel’s entrance. 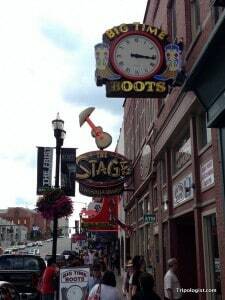 If there is one street that epitomizes Nashville, it’s Broadway. Running through the heart of the city, the four blocks of Broadway between 5th Avenue and 1st Avenue are some of the most interesting in the nation. Take a stroll down Nashville’s Broadway for a chance to catch some of the best up-and-coming country music acts. With multiple bars on every block, each featuring no cover charge and live country music, you’re bound to find a sound that you like. Some of country music’s biggest stars got their start playing in these bars, and you’ve got a good chance of discovering country music’s next superstar when you visit. The area doesn’t just feature bars, however. Shops selling souvenirs, cowboy boots on “buy one, get two” specials, and barbecue restaurants make up this eclectic area. No visit to Nashville is complete with a stroll through the city’s soul. Despite being a fairly conservative city, Nashville is home to many local beer and coffee brews, and no trip to Nashville would be complete without sampling a few of the city’s best. For beer, check out the Yazoo Brewing Company, which has limited taproom hours, but offers tours on Saturday afternoons. Also worth sampling is the Big River Brewing Company located right on Broadway. For coffee, Crema, Frothy Monkey, Fido, and Bongo Java all get rave reviews and are located in the downtown area. Crema is located closest to Broadway and gets the highest marks. 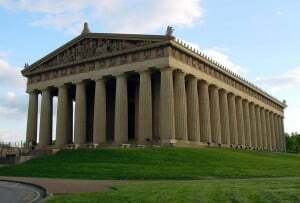 Nashville’s full-size replica of the Parthenon is one of the oddest attractions in all of the USA. Did you know that Nashville is home to a full-size replica of the Parthenon? However, unlike its more popular, and much older, likeness in Athens, Greece, this Parthenon is actually intact. Built in 1897 as part of Tennessee’s Centennial celebration, the Nashville Parthenon was built because Nashville was then known as the “Athens of the South”. While the Parthenon was one of several Greek replicas built, the Parthenon was the only one that was preserved. Inside the Nashville Parthenon is an art museum, capped with a re-creation of the original statue that used to grace the real Parthenon. In a city filled with performance venues, the Grand Ole Opry House is the one all country musicians want to play in. Featuring some of the genre’s most famous acts multiple times per week, catching a Grand Ole Opry show is a must for any fan of country music. 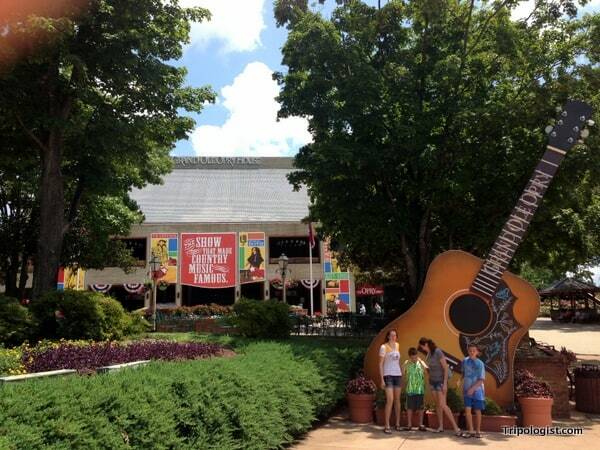 Located next to the Opryland Hotel, the Grand Ole Opry House has been located in its current home since 1974. Prior to that, the Opry was hosted for 50 years in the Ryman Auditorium in downtown Nashville. Find somewhere great to stay in Nashville, Tennessee! Do you have a favorite thing to see or do in Nashville that I didn’t include in my list? Let me know in the comments section below.